You demand maximum performance from yourself on the track, and being comfortable is the best way to stay focused durig sport riding. Whatever the conditions, the first line of defense is your base layer, or the undersuit beneath your leathers or other riding gear, because that's the clothing that does the most to regulate your own personal environment and keep you cool when it's hot. In hot weather, the MOTO-D Cool-Tec motorcycle undersuit fits under your leathers, making it easier to slip in and out of your gear. The smooth material wicks moisture away from your skin so it evaporates quickly, keeping you cool and not weighing you down like a soggy cotton T-shirt. 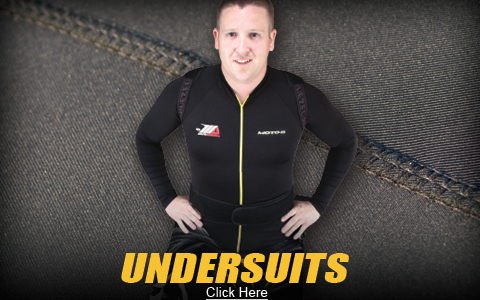 For additional protection, step up to the MOTO-D Cool-Tec undersuit with integrated D30 chest armor. Either way, the hi-stretch fabric fits like a second skin without bunching up or getting in your way when you're trying to nail the apex of the next turn faster than you've ever hit it before.